Today, 10 October 2018, is the 16th World Day Against the Death Penalty. This year, the aim of the World Day is to raise awareness of the inhumane living conditions of people sentenced to death. Although people on death row are entitled to the same basic rights and treatment conditions as other categories of prisoners, as set out in the UN Standard Minimum Rules for the Treatment of Prisoners (the Nelson Mandela rules), many testimonies document the inhumane living conditions that people sentenced to death endure. To mark the World Day Against the Death Penalty, PRI has published a new factsheet examining the prison conditions of women living on death row. There are at least 500 women currently on death row around the world. While exact figures are impossible to obtain, it is estimated that over 100 women have been executed in the last 10 years – and potentially hundreds more. Little empirical data exists about the crimes for which women have been sentenced to death, the circumstances of their lives before their convictions, and the conditions under which they are detained on death row. This factsheet, jointly published with the Cornell Center on the Death Penalty Worldwide, focuses on the latter topic, with some introductory remarks on the profiles of women under sentence of death. It draws on recent research published by the Cornell Center, which has shed light on this much-neglected population. The factsheet is available in both English and French. In addition, Delphine Lourtau and Sharon Pia Hickey of the Cornell Center have written an expert blog for PRI, which discusses the Center’s recent research report, Judged for More Than Her Crime: A Global Study on Women Facing the Death Penalty. The report found that most women are sentenced to death for the crime of murder, often in relation to the killing of family members and in a context of gender-based violence. Women who are sentenced to death are also subjected to multiple forms of gender bias, with women who are seen as violating entrenched norms of gender behaviour more likely to receive the death penalty. 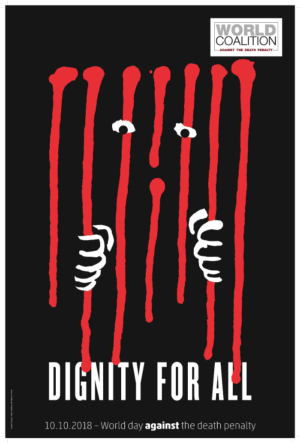 The World Coalition Against the Death Penalty, of which PRI is a member, has put together a number of resources and tools to help raise awareness of this year’s World Day. Information about the World Day is also available on the World Coalition’s website in Spanish, Arabic, Chinese, Russian and Farsi.